Our 5 part Missing People Choir series continues. This week, we catch up with choir members Emma Cullingford, Louise Vesely-Shore, Jan Lovett, Cherryll Williams and Sarah-Jane Clements to ask them about their experiences of joining the choir, singing and performing with each other, and of course, recently auditioning on Britain's Got Talent. 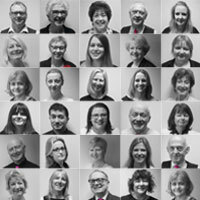 Sarah-Jane: They were looking for members to support the families as they sang, and as Missing People is a local charity to me and one that I feel very supportive of, I was keen to get involved. 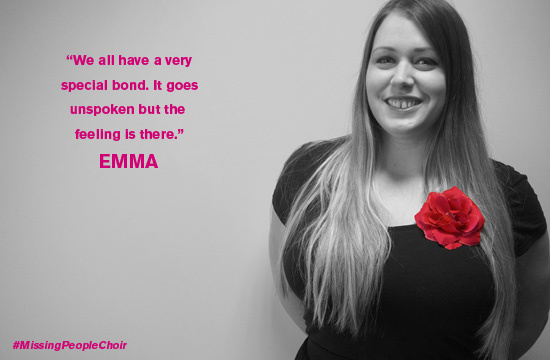 Emma: I went to my first Missing People carol concert at St Martin-in-the-Fields the year my Mum was missing - a choir performed and it made me want to join a choir. Shortly after, Clare got in touch and told me they were setting one up. It felt like synchronicity coming together at just the right time and so I jumped at the chance. 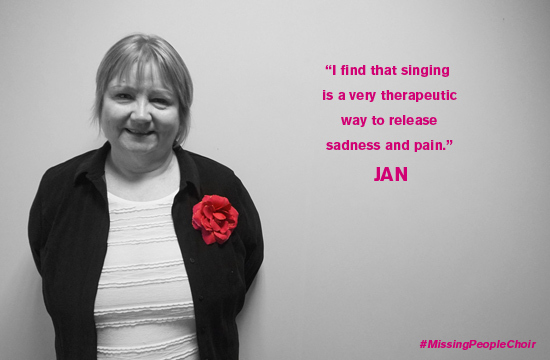 It’s great to be able to use one of my passions – singing – to help Missing People who have a fond place in mine and my family’s hearts after all the wonderful support they have provided us. Jan: When our daughter first went missing, we relied on the police for support and had never heard of the Missing People charity. Now that I know about the wonderful work the charity does, I want to let other families know there is an organisation that can help them. I find that singing is a very therapeutic way to release sadness and pain. Jan: It feels like I’ve become part of another family, where we support and understand each other. Cherryll: It is a privilege to sing with the family members supported by the charity, and to contribute with our heartfelt sympathy for their losses by joining with them in song to express their feelings. Emma: It’s a real honour. We all have a very special bond. It goes unspoken but the feeling is there. We’re all really supportive and protective of one another and it feels like one big family now. I think we all find it very therapeutic. 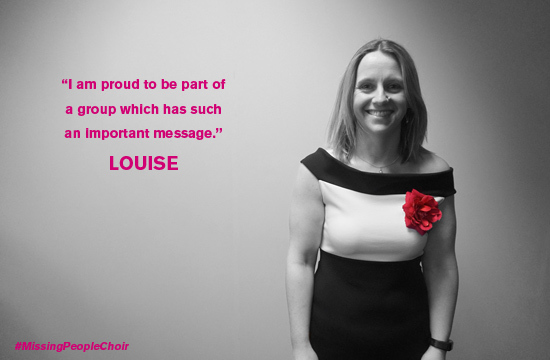 Louise: I am proud to be part of a group which has such an important message and can hopefully bring some form of comfort to the families of those missing, whilst also raising awareness and hopefully support for the charity. Sarah-Jane: It means a lot to me. Given what the family members are going through and continue to go through on a daily basis, I feel glad to be able to do something that supports them. Music has a profound effect on people’s lives - and I have seen first-hand the difference that singing together and communicating their message makes. Emma: I feel like I’ve had the biggest journey with 'I Miss You'. Even though I have to desensitise myself to the lyrics to be able to sing it, sometimes the lyrics hit you and it brings all the emotions to the surface. It’s an incredibly powerful song. Louise: This is really difficult – I think probably 'I Hope' as it is a really beautiful song with a great message, but also felt that the song penned by Alice Gross was so powerful, and felt very honoured to be singing the song, it seemed like there was something beautiful that we had managed to salvage from such a tragic story. 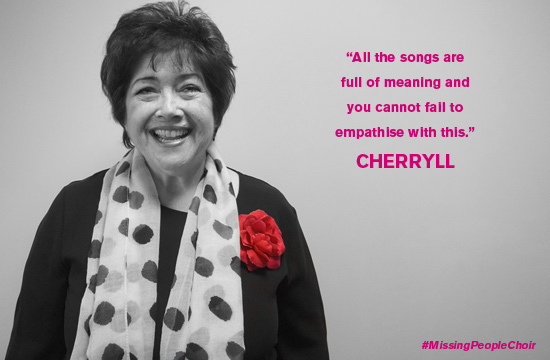 Cherryll: All the songs are full of meaning and you cannot fail to empathise with this; however, I think 'I Miss You' just tips the balance as it is so very succinct. Jan: My favourite song has to be “I Miss You”. These lines sum up my feelings: “I never thought I’d be without you. I’d always thought you’d be here safe with me”. Louise: Not sure – being a bit of a geek I was really excited about performing on Crime Watch but the early start wasn’t my favourite! Singing in St Martin-in-the-Fields at the Missing People Carol Concert is such a joy that I do really look forward to it. Sarah-Jane: Our audition for Britain’s Got Talent on stage at the London Palladium. I felt that the choir really came together that day, and it was just beautiful. It was a shared moment and one that none of us will ever forget. Louise: The really positive response we received from all of the crew and the presenters and judges was amazing. Jan: I most enjoyed seeing the audience reaction at the end of our song. I wasn’t expecting it! Cherryll: The thrill of singing on the stage of The London Palladium. 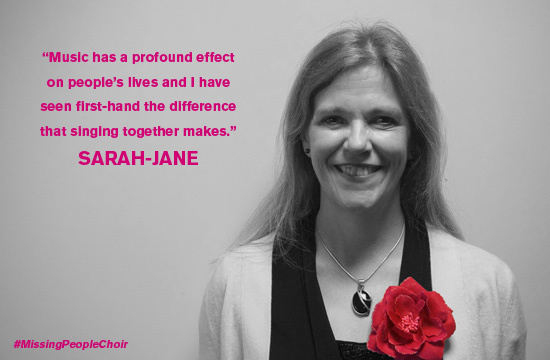 Sarah-Jane: It was a great opportunity to really bond with the rest of the choir. We had never spent such long periods time together before, and I now feel I know everyone much better. Emma: I loved every minute of the audition! I don’t remember how I sang at all – it was so terrifying but then to have the reaction we did was utterly extraordinary. That’s when the emotions of the enormity of what we had just done really kicked in for me – the wonderful reaction we got from the audience and judges and how much my mum would have loved it if she were still here.